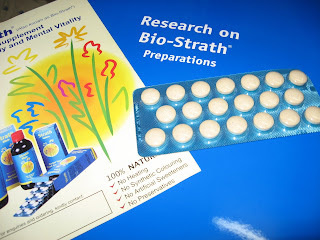 Bio-Strath Tablets contain an herbal yeast complex rich in vitamins, minerals, enzymes, antioxidants, protein, amino acids and are ideal for children who are diabetic or on a specialized diet for canida infection because they contain no added sugar. 100% Natural. Enhances a sense of well-being, improves short term memory and concentration, increases energy and improves physical endurance, helps recovery from physical exertion. Bio-Strath is an herbal yeast supplement produced using a unique process whereby a specially cultured food yeast (saccharomyces cervisiae) is nourished in a broth of 15herbs. This continues for days until the yeast cells absorb all the beneficial properties of the herbs. This herbal yeast is then liquefied by fermentation, carefully dried and mixed with natural binding materials to produce the tablets. The nutritional herbal yeast is readily available to the body and easy to digest. The original Swiss Herbal Yeast Supplement whatever our age, there are times when life demands that little bit extra, particularly when we are under pressure, felling tired and run-down or recovering from illness. Fatigue and tiredness can affect our daily lives and that's when Bio-strath can help. Only Goodness Goes in Bio-Strath ltd.
Was founded by Fred Pestalazzi in 1961 as a result of his personal experience with using this unique herbal yeast to treat his own health problems. In the family owned facility, overlooking Lake Zurich in Switzerland, the greatest possible care is taken to ensure that only goodness goes into Bio-Strath. This special Herbal Yeast Supplement is available in over 40 countries around the world. Persons susceptible to candida infections can take Bio-Strath without worry. The yeast in Bio-Strath is the good food yeast, and is unrelated to the candida yeast. 1) Take 02 tablets, 02 times daily (morning & evening). 3) Dosage may be increased as desired. 4) Children under 12 may take 1/2 of the adult dosage. As a whole food, Bio-Strath may be taken with meals or by itself. Liquefied Dried Yeast (saccharomyces cerevisiae), Cellulose, Apple Pectin, 15 Dried Herbs, Angelica Root (angelica archangelica), Lemon Balm Leaf (melissa officinalis), Basil Aerial Parts (ocimum basilicum), Chamomile Flower (matricaria recutita), Cinnamon Bark (cinnamomum cassia), Caraway Seed (carum carvi), Elder Flower (sambucus nigra), Fennel Seed (foeniculum vulgare), Horseradish Root (armoracia rusticana), Hyssop leaf (hyssopus officinalis), Lavender Flower (lavandula angustifolia), Parsley Aerial parts (petroselinum crispum), Peppermint Leaf (mentha xpiperita), Sage Leaf (salvia officinalis), and Thyme Aerial parts (thymus vulgaris).